In April 2013, Chinese student Dun Meng (played here by Jimmy O Yang) was carjacked by the Tsarnaev brothers who were on the run from the police for the Boston Marathon bombing. The manhunt lasted four days and eventually shut down the city. Meng eventually made the decision to jump out of his car and run for help at a gas station, describing it as 'the most horrifying moment in my life'. Director Peter Berg (Deepwater Horizon, Lone Survivor) does justice to his terrifying ordeal and the events that preceded it with this gripping re-enactment based on the book Boston Strong. Berg regular Mark Wahlberg stars as Tommy Saunders (a composite of several law enforcers, and a character who represents the strength and frustration of the Boston people). Tommy has recently been demoted and is tasked with security at the marathon's finishing line. When the first bomb goes off he heads directly into danger to help those who have been injured. Berg pays tribute to the real-life heroes who helped thwart the terrorists with a visceral race-against-the-clock that also manages to find time for a sense of humour. The innocence of the morning of the bombing is wonderfully depicted via the daily routines of his characters. Watertown police sergeant Jeff Pugliese (JK Simmons) wakes up fresh-faced next to his wife and drives to Dunkin' Donuts to pick up breakfast, leaving his cigarette outside burning on the ledge – that's how sure he is of exactly how his day will pan out. Utilising a fine cast that also includes Kevin Bacon, Michelle Monaghan and John Goodman, Berg goes to great lengths showing the minutiae of each day and draws the distressing event and its aftermath together using edge-of-your-seat tension. With graphic depictions of the explosions from ground level, Berg never shies from the horror of an attack which killed three civilians and injured over 260 more, yet the emphasis is firmly on humanity, hope and bravery. 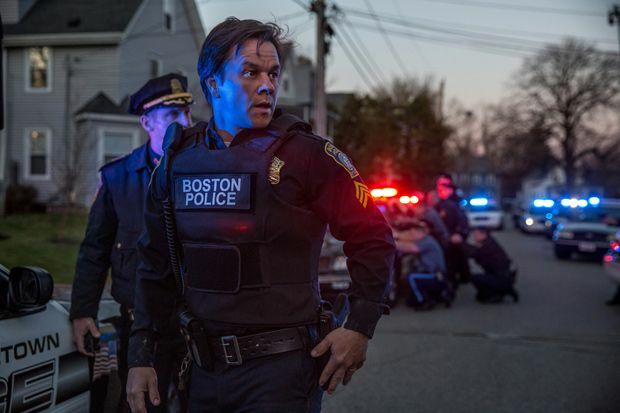 General release from Thu 23 Feb.
Tommy Saunders (Wahlberg) is a Boston cop who’s standing at the Boston marathon finishing line when bombs start going off. A visceral and respectful take on the incident, never shying from the horror of the attack but placing the emphasis firmly on humanity, hope and bravery.